The Camlachie chapel was built in 1877 and served its community up until 2014. It has been completely converted into a cozy, rustic sanctuary on the southern tip of Lake Huron. All the beauty of the original church remains, resulting in a unique experience for your next getaway, or event. Contact me about a special booking. 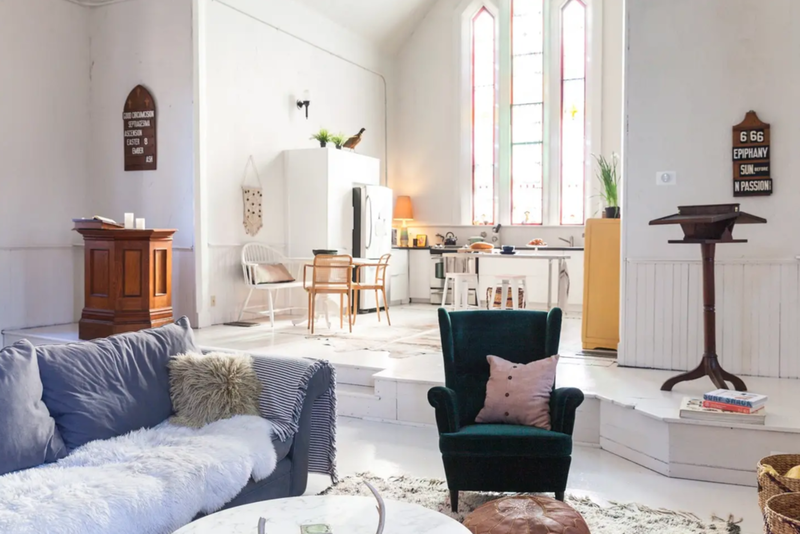 The chapel, with its spacious and inviting living, playing, and dining areas, is virtually unchanged with soaring ceilings, gorgeous beams, all original trim, stained glass and flooring, complete with gas wood stove. A bedroom in the choir loft above oversees the sanctuary, with a private room on the main floor below the loft for extra guests. The large kitchen sits under the incredible 20' tall wall of stained glass in the original altar. The hall, added in 1970, has been transformed into a modern, private, master suite with full bathroom. There's also a powder room adjacent the kitchen, and full laundry. The property has a large yard with a fire pit and backs a field offering a perfect spot to watch the sun set. Only a three minute drive to several virtually-private beaches, you’re perfectly situated to enjoy all that the area has to offer. With its fantastic acoustics, light, and energy, any singer/songwriter, photographer, writer or otherwise creatively-inclined will be inspired. The chapel is available for daily- and hourly- rentals during the slower season. If you’re getting married in 2020 and think the Camlachie Chapel might be the spot to tie the knot, let’s talk!